The National Capitol Columns originally supported the old East Portico of the United States Capitol (1828). The columns were removed during expansion of the Capitol in 1958. 24th and R Sts., NE. 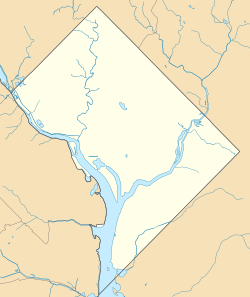 The United States National Arboretum is an arboretum in Washington, D.C., operated by the United States Department of Agriculture's Agricultural Research Service as a division of the Henry A. Wallace Beltsville Agricultural Research Center. It was established in 1927, by an act of Congress after a campaign by USDA Chief Botanist Frederick Vernon Coville. 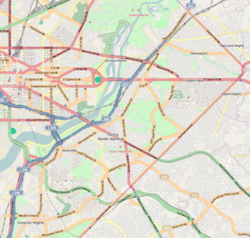 It is 446 acres (1.80 km2) in size and is located 2.2 miles (3.5 km) northeast of the Capitol building, with entrances on New York Avenue and R Street, Northeast. The campus's gardens and collections are connected by roadways that are nine miles long in total. The arboretum functions as a major center of botanical research. It conducts research on trees, flowering plants, shrubs and turf, as well as the development of plants. It has a library with 11,000 volumes and approximately 100 publications concentrating in botanical literature. Classical Chinese Garden (proposed), a 12-acre (4.9 ha) garden designed by a joint team from China and the United States. Arbor House Gift Shop operated by National Capital Area Garden Clubs, Inc. The collection includes a Japanese White Pine, (Pinus parviflora 'Miyajima') bonsai tree, donated in 1975 by Masaru Yamaki to mark the US bicentenary. This tree was formerly in Hiroshima, and survived the atomic bomb dropped in that city in 1945. The tree has been "in training" since 1625. The Arboretum features a small group of public artworks including Split Ritual by American sculptor Beverly Pepper. The piece is made of ductile iron and stands at H. 10 ft (3.0 m) x W. 44 in (110 cm) x D. 100 in (250 cm). It consists of four vertical pieces that look like large tools. They are placed in a circle on top of a doughnut-shaped flat foundation and each tool is unique. The sculpture was dedicated in 1993 and in the same year was surveyed by the Smithsonian's Save Outdoor Sculpture! program and its condition was declared as well maintained. The United States National Arboretum was established by an act of Congress in 1927. The act authorized the establishment of the arboretum on what was then called Mount Hamiton, but it did not actually appropriate any funding to make that happen. That particular area was well-suited for the arboretum because it had varied soils and physiography, and no buildings had been built there yet. Ten months later, President Calvin Coolidge signed the law appropriating $300,000 for the National Arboretum. At the time, the federal government owned only ten percent of the land, but it purchased the rest of the land by 1931. ^ "Frequently Asked Questions". usna.usda.gov. Retrieved 29 December 2016. ^ "History and Mission". usna.usda.gov. Archived from the original on 23 August 2011. Retrieved 29 December 2016. ^ "U.S. National Arboretum" (PDF). usna.usda.gov. Retrieved 29 December 2016. ^ "A Classical Chinese Garden at the U.S. National Arboretum". usna.usda.gov. Retrieved 29 December 2016. ^ a b "Garden Displays, Collections & Structures". usna.usda.gov. Retrieved 29 December 2016. ^ Siddiqui, Faiz (2 August 2015). "This 390-year-old bonsai tree survived an atomic bomb, and no one knew until 2001 - The Washington Post". The Washington Post. Retrieved 6 August 2015. ^ "US National Arboretum Bonsai Photo Gallery". United States National Arboretum. Retrieved 6 August 2015. ^ Save Outdoor Sculpture! (1993). "Split Ritual, (sculpture)". Save Outdoor Sculpture!. Smithsonian. Retrieved 26 December 2010. ^ a b "Arboretum and Botanic Garden". The Washington Post. March 5, 1927. p. 6. ^ "Failure to Obtain Arboretum Funds Blow to Southeast: Citizens Hoped Bill Would Authorize Mt. Hamilton Area, Tucker Declares". The Washington Post. March 7, 1927. p. 7. ^ "Nation to Have Arboretum on Plot Near Washington: Negotations in Progress for Purchase of Land For Great Garden Project". The New York Times. April 7, 1929. p. 15. ^ Murphy, Marvin (May 12, 1929). "A National Arboretum", The Baltimore Sun. P. 16. ^ "Coolidge Signs Bill Covering Deficiencies". The Washington Post. December 23, 1927. p. 20. ^ "Washington National Arboretum to Aid Horticultural Research". The New York Times.August 2, 1931. p. 4. Wikimedia Commons has media related to United States National Arboretum. This page was last edited on 7 April 2019, at 00:45 (UTC).